There is a certain theatre to the Global War on Terror (GWoT). From the opening sequence of 9/11 to the shock and awe campaign’s projection of American sovereign power through the broadcast of the initial ariel bombardment of Iraq, to the dramatic headline declarations that ‘we got him!’ after an elderly and disheveled Saddam Hussein was ‘caught like a rat…in the bottom of a hole’ in Iraq in December 2003, the GWoT has played out as a highly dramatic production. As a part of the GWoT, Guantanamo Bay’s Camp Delta has featured too – making both dramatic appearances and disappearances from the frame since its 2002 inception. The most recent of these is the big reveal of the Camp’s make-over under the Trump Administration. 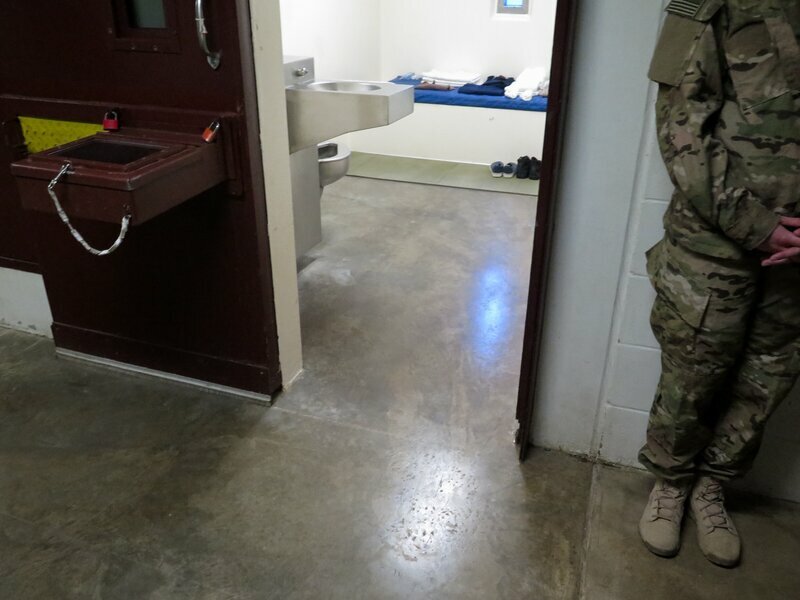 Having canceled Obama’s 2009 Executive Order to close the Camp in January, a selection of journalists were provided new ‘Media Ground Rules for JTF-GTMO‘, re-admitted to the Camp, and given a tour of detainee areas and quarters this month for the first time since a media black out was enforced in 2014 during powerful hunger strikes written about by both myself and Lauren Wilcox. In this short post I provide an overview of the Camp’s visual politics and some very initial analysis of reports and images emerging from Camp Delta this week. I argue that updated policy and practices, and new photographs emerging reveal dominant American bodies (Government and military in kind) becoming increasingly un-concerned with the maintenance and projection of a Liberal, biopolitical (life-centred and affirming) facade into the eyes of the international community and are therefore in the process of re-making America’s identity on the world stage. On their 2002 arrival at Camp X-Ray, detainees – shackled, gagged, and clad in bright orange jumpsuits, mittens, blacked out goggles, and noise cancelling headphones – were paraded and photographed by their new captors, Joint Task Force Guantanamo (JTF-GTMO). These photographs – officially captured, sanctioned, and named the orange series – saturated the global media, burned into the public eye’s retina, made Camp X-Ray and its orange-clad detainees became hypervisible. In its boastful display of America’s subdued captives, the orange series speaks of retribution and revenge and in this way its 2002 global circulation worked (along with the broadcast of the shock and awe campaign) to reassert American sovereign power, project global American dominance, and as a means of global intimidation. The enemy had been captured and rendered powerless, at the mercy of the mighty American military. At the same time the orange jumpsuit itself became iconic as Elspeth Van Veeren so astutely noticed. Indeed, the orange jumpsuit in which detainees were paraded and photographed became iconic material objects that, imbued with American power, intimidation, and violence, went on in the years following 2002 to make several high profile appearances – un-sanctioned by dominant contemporary American bodies – to the American public eye and wider audience. 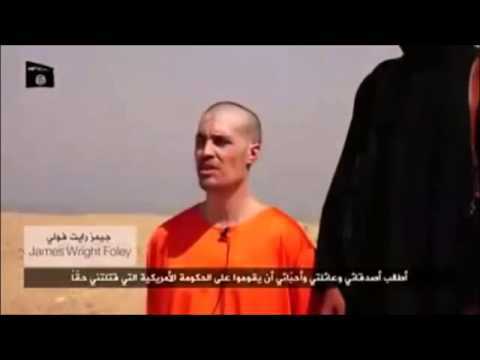 Most notably, the orange jumpsuit clothed James Wright-Foley, an American journalist and video reporter, as he was filmed and beheaded by ISL in August 2014. 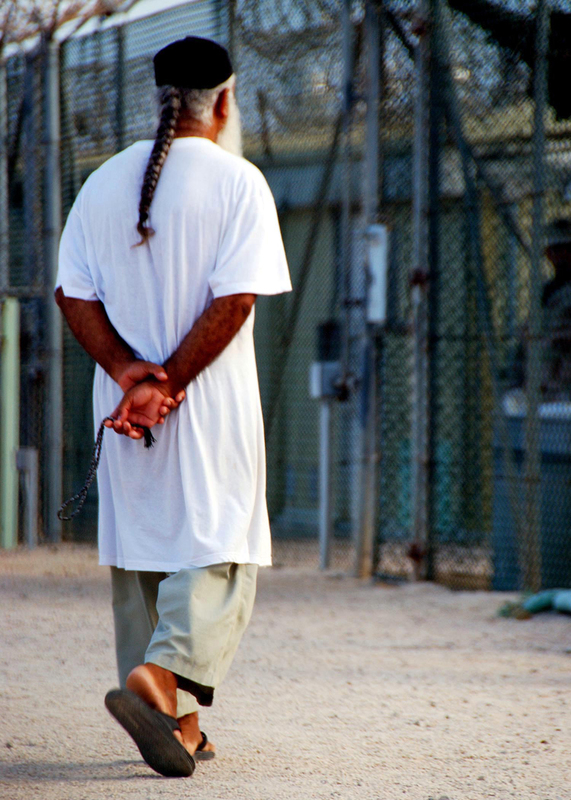 Camp Delta’s detainees were then moved decidedly out of the sight of the American public eye and wider global audience through the media black-out imposed in the wake of the 2013 – 2015 hunger strikes. Thus, this week’s press tours are the first time a glimpse of life inside Camp Delta has been made visible under the Trump Administration. With the Miami Herald’s Carole Rosenberg and NPR’s David Welna reporting similarly on the obvious signs of expansion, what is striking about the JTF-GTMO sanctioned images coming out of the Camp this year is their lack of polish and any overt staging. In contrast to both the orange and white series’, the aesthetic projected is one of everyday banality. Moreover, featuring a distinct lack of detainees (there are currently 1,700 troops and contractors responsible for 41 detainees) these most recent images suggests a detention Camp ready and waiting to be filled with fresh meat. Finally, with Trump removing ‘legal’ and ‘transparent’ from Camp Delta’s Bush era imposed mission statement to provide safe, humane, legal and transparent care and custody of detained enemy combatants and the above cited conversation between Welna and JFT-GTMO’s food operations officer revealing the normalisation of the ongoing torturous practise of force-feeding hunger striking detentions under Trump, future policy and practice at Camp Delta is likely to further undermine and degrade the Liberal, biopolitical, facade now somewhat half-heartedly and feeble projected by dominant contemporary American bodies to the outside world under the present leadership. However, this goes on to the detriment of America’s historically carefully guarded and fastidiously maintained image as beacon of democracy and leader of the free world. The knock-on political, economic, diplomatic, and other effects of this American (re)invention in normative, ‘soft power’, ideational terms will surely be profound and therefore present themselves as important areas for future research along with the marked aesthetic shift discussed in this post.